The creative arts play an important role in the life of the congregation. Our many talented members find outlets for their diverse artistic abilities in a variety of opportunities. 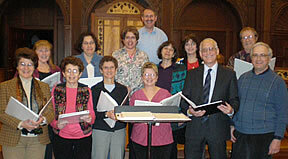 On Shabbat Zimrah, the congregation’s musicians enrich Friday evening services with the beautiful sounds of the harp, violin, flute, guitar, keyboard, piano, and drums. Or Hadash announces the New Klezmaniacs!! The New Klezmaniacs formed in January 2015, and include former Klezmaniacs members Carol Mueller-Bell (accordion, vocals), Sandy Saull (violin), Debby Dekalb (flute), Barry Bell (percussion) and Lilli Klotz Foster (violin). They are joined by Phil Rosenberg (piano), Adam Kupersmith (percussion), and Josh McHugh (clarinet). They first publicly performed at the 2015 Congregational Meeting. Klezmer is the musical tradition of Ashkenazic Jews for weddings and other simchas. The tunes range from slow and mournful to fast and frenetic, and almost all are meant for dancing. Lyrics to songs are generally in Yiddish. The notes and rhythms of Klezmer music are both related to and different from classical modes and keys. The roots of Klezmer music are in Eastern Europe and nearby Middle Eastern regions.